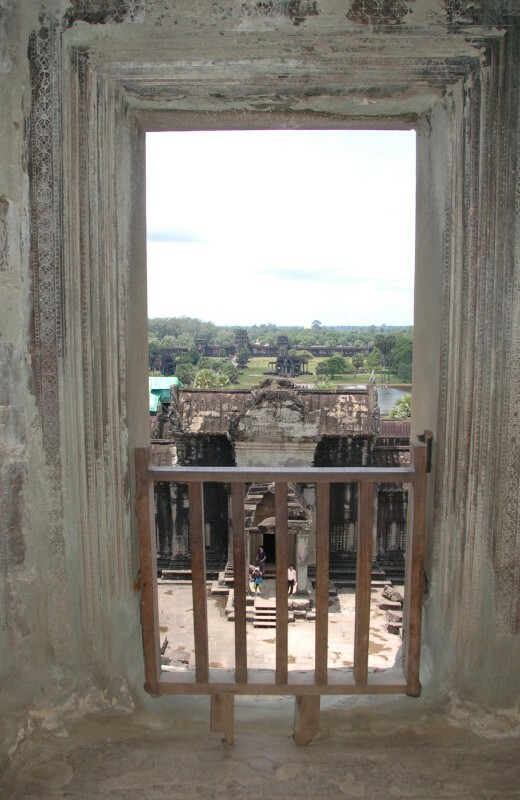 I have wanted to visit Angkor Wat since I was a teenager. Growing up in Indonesia and Malaysia, I had the opportunity once to visit the Borobudur and Prambanan at a time when people didn’t recognize those names, thanks to my dad who took my older brother and me. The Borobudur is magnificent: the largest Buddhist temple in the world, I believe, and the Prambanan is this superb, dark-stoned, multi-pyramid-shaped artifact harboring Hindu gods like Gonesh, just waiting for their homage. But I remember being told once that it was nothing compared to glory of Angkor Wat. Well, them’s fightin’ words! So, more years than I care to admit to later, I FINALLY have the chance to see this place that has been elevated to a stratosphere beyond anything I could ever imagine. A place more beautiful and enchanting that Borobudur! More fascinating that the crumbling ruins of Prambanan! More mystical than the verdant swaths of jungle from which these structures rise! Naturally, I was bound to be slightly disappointed. 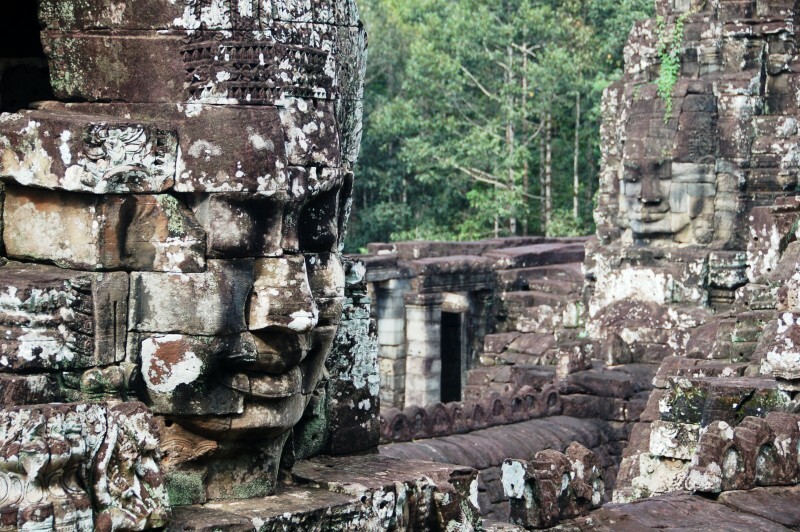 Tip 1: Currently, 3 types of passes to the Angkor Archeological Park, which covers most of the major ruins one would come to visit, are available: the 1 day pass for $20 USD, the 3 day pass for $40 USD and the 7 day pass for … I can’t remember. But the cool thing about the 3 and 7 day passes is that they may be used at any time during a 7-day or 1-month period, respectively. We got the 3 day pass. Tip 2: Most people recommend visiting Angkor Wat as early in the morning as possible, both for the benefits of lighting as well as beating the crowds (and it gets CROWDED!). We were on a conference tour for the first day, and we had a day off on our second day, so we slept in. All that to say, for better or for worse, we did not did not heed the early-morning advice. 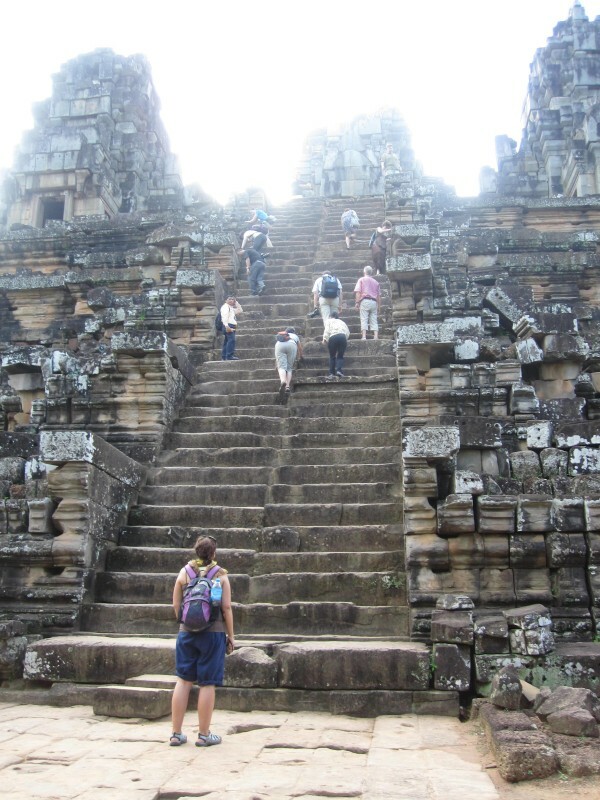 Tip 3: The ruins found within the Angkor Archaeological Park, which encompass Angkor Wat as well as many other sites (the park itself is around 400 square kilometers! 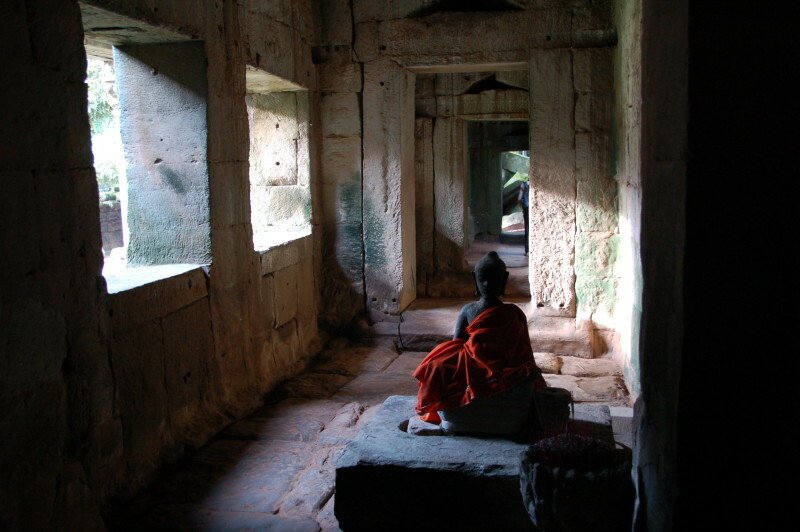 ), are not just temples but rather the ruins of cities built by various kings over hundreds of years (802 AD to 1432 AD!). In fact, the first king to found the Khmer empire, interestingly enough, actually came from the land of the Borobudur and Prambanan: King Jayavarman II, who showed up around 802 AD after having lived an undetermined amount of time for an undetermined reason in Java, Indonesia. He announced Cambodia’s independence from Java, proclaimed himself god-king and began the Angkor kingdom that we marvel at today. 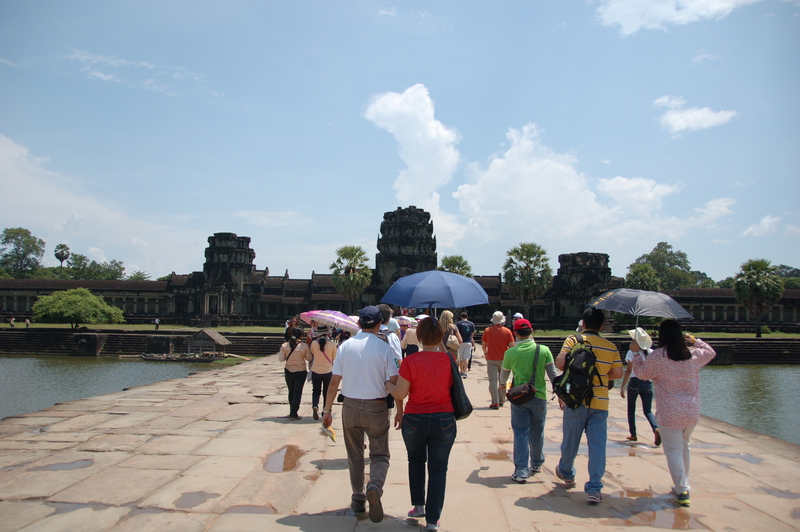 The word “Angkor” means Capital City or Royal City. 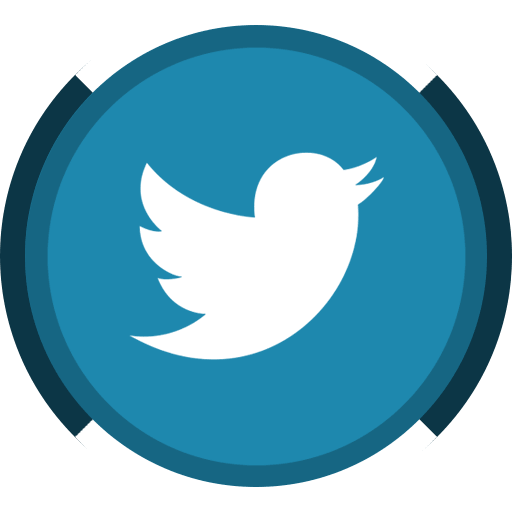 “Wat” is a word commonly used to mean Temple or Holy. Day 1: For our first day, we loaded into mini vans as part of a group tour arranged through my husband’s conference. The most famous monument of the Angkor Archaeological Park, I can see why it is routinely recommended to show up as early as possible (and by that, 4-ish in the morning!) because when our bus rolled into the parking lot, it was glaringly hot, and since it was also in the middle of the day, completely overrun with tourists such as ourselves. It was still impressive, but as it turns out, not one of our favorites. Maybe it was the time of day or glut of visitors, but to Sam and me at least, it didn’t have the ambiance other temples offered. Built by King Suryavarman II between 1112 to 1152 AD in under 40 years (um, hello La Sagrada Familia! ), it was originally a Hindu structure which has since become a Hindu and Buddhist holy site, and is also touted as the largest religious building in the world! 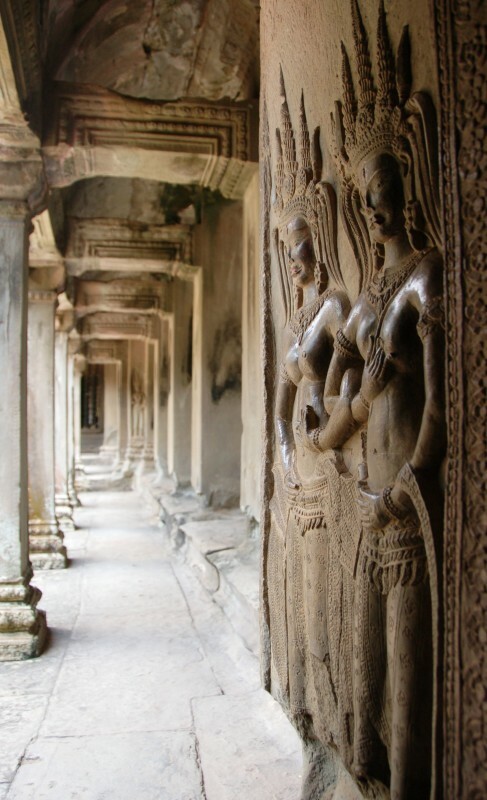 I did like the bas-reliefs found within the temple and all of the Apsara’s (heavenly nymphs) gracing the walls. Notice how the chest area seems especially shiny? Hmmm…. The picture here is meant to show the other side of things. 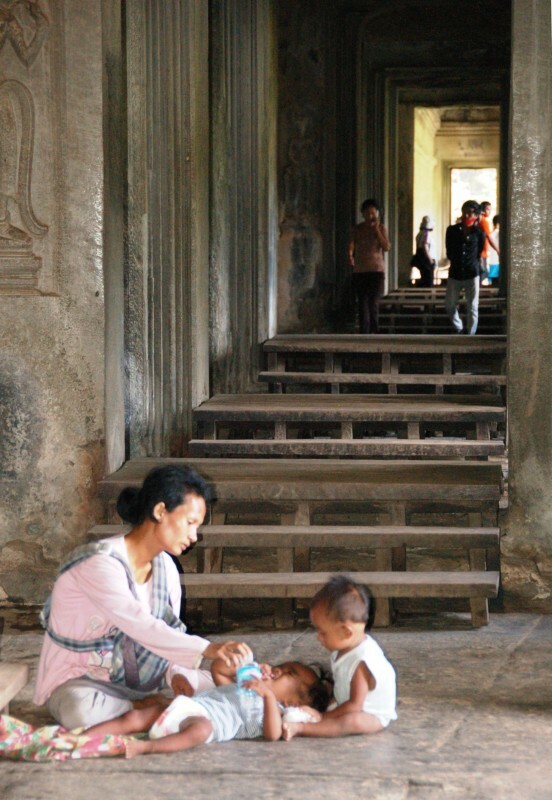 Poverty is everywhere, and it’s a strange incongruity to gawk at beautiful archways and ancient-carved walls when footsteps away, a family just hopes to find enough change for dinner. There’s something about this that sums up so much of what I felt while visiting, and it proves a stark contrast to where we currently live in Tonga, where very few are wealthy, but almost everyone has food and shelter. 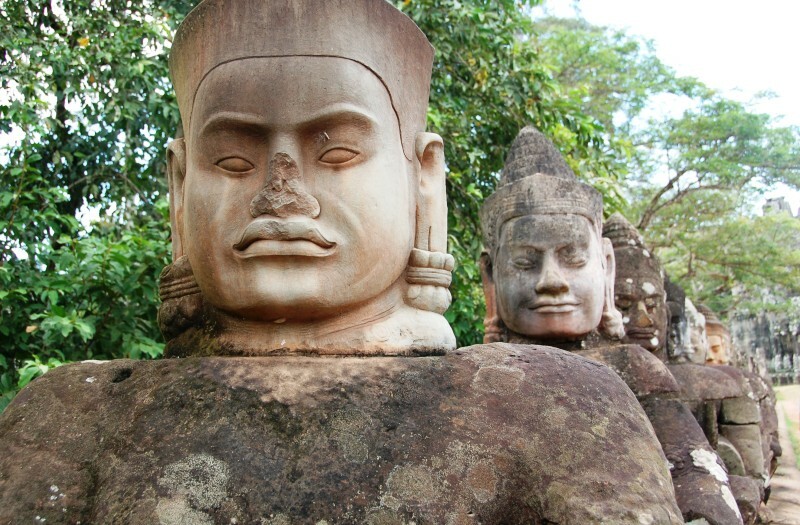 Just north of Angkor Wat, the complex/city of Angkor Thom and its temple Bayon await. Built by King Jayavarman VII at some length of time between 1181 and 1219, it features four fantastic gates, North, West (well, that one’s crumbled, I think), East and South respectively, shaped into giant renditions of “Avalokiteshvara’s” visage (the Bodhisattva of Compassion), but many speculate the faces are actually of Jayavarman himself. Sandstone bridges lined with carvings depicting the Churning of the Sea of Milk, which I do not pretend to understand, lead across a once active moat and through the looming gateways. 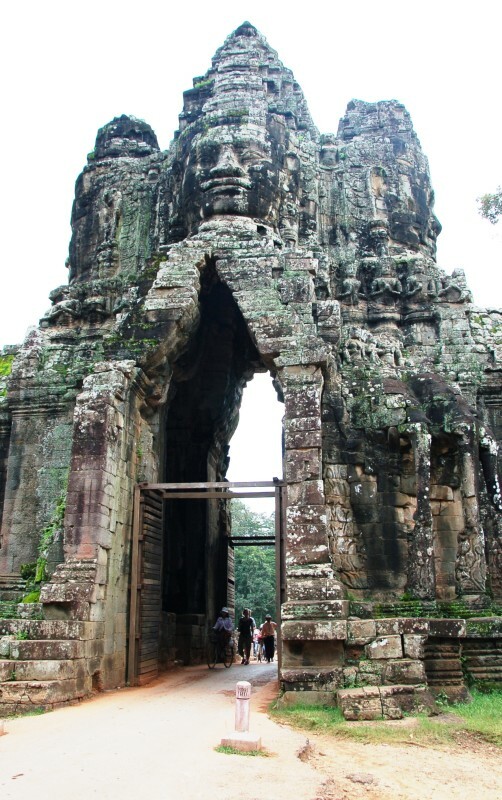 Once inside the temple, everywhere you turn, giant faces return your gaze. It’s a bit surreal. An interesting thing our guide told us: Bayon was originally called “Banyan” because there were many banyan trees growing around the complex. The banyan trees were eventually uprooted or else they died — that part was not clear — and so the name was changed from Banyan to Bayon! Perhaps better known as the “Tomb Raider Setting,” Ta Prohm might be more readily recognized than Angkor Wat itself, thanks to that venerable movie. The ambiance really is fantastic; tangles of giant, serpentine roots crawl over stone and join into other vegetation, and even with the mass of people walking everywhere (and there are a looooot of people), the mystical, I-just-stumbled-upon-it feel of this jungle-temple can not be denied. There’s another complex much further off, Beng Mealea, that claims a similar vibe without as many tourists, but we weren’t able to visit that one. And just to provide an idea of how crowded it can get, here’s one taken at a particular spot that I can only assume is showcased in the movie mentioned above? There was literally a line of people shoving their way to this area to get their own portrait. 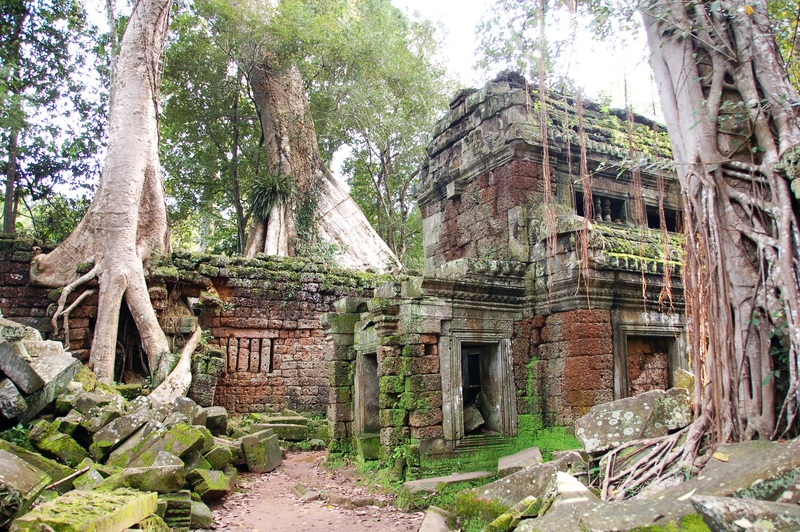 Tomb Raider Setting at Ta Prohm? On the way out, we walked through shadowy halls where the windows dripped with vines and roots, filtering the sunlight. It was peaceful and cool, and a world away from the blitz of people and photographs outside. Our last stop for the day, Pre Rup, built by King Rajendravarman II around 944 to 968, is a site most commonly frequented for its sunset views. And a person has to work for that view, believe me! Those steps are lot more demanding than they appear in the photo, and the higher up you get, the steeper and more narrow they become. Now, I have big feet, but still, it is a little strange to have to step sideways just to gain a footing, and as you ascend, it gets more complicated. You end up doing a kind of crawl up the stairs, due to the steep angle — dignified, it is not! 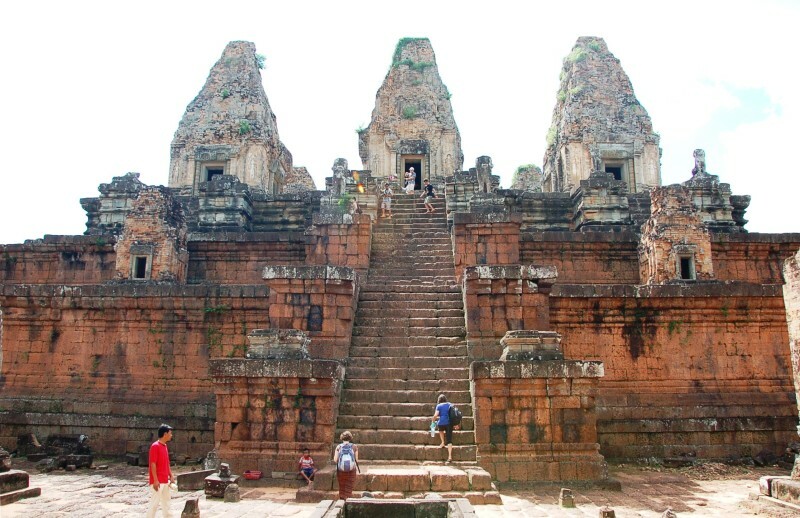 Pre Rup (which purportedly means “Turning the Body”) is believed to have been a royal crematorium. They must have had excessively fit priests performing that service back in the day, as everyone here had trouble just getting themselves up. The view from top can be terrific, I’m sure, but I didn’t really get any of that. It was very crowded, so this was the best I could do. But hey, I got in some good cardio! 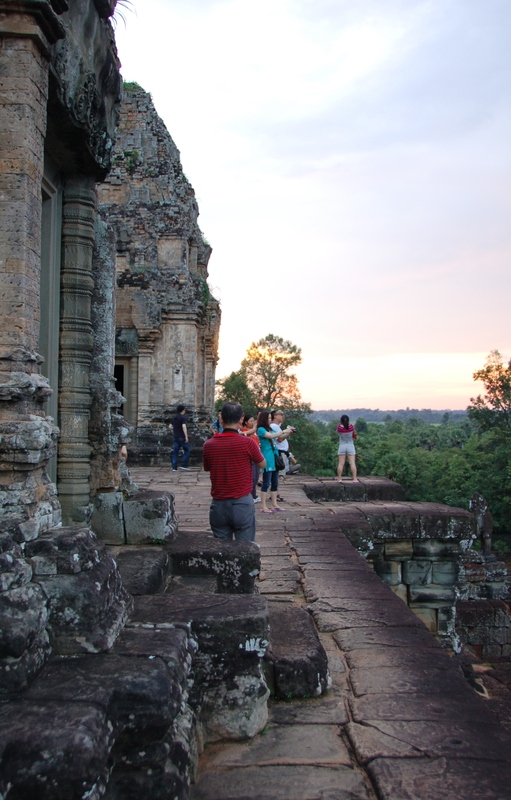 Pre Rup is also a major tour bus stop because of the excellent restroom facilities just down the road. It’s actually kind of a peaceful place as the building sits by a chirping swamp with lily pads, and feels somewhat removed from all the chaos. I sat on the bench outside for a little while, just enjoying the quiet, but was soon swarmed with adorable children selling crafts woven from dyed strips of coconut fronds. 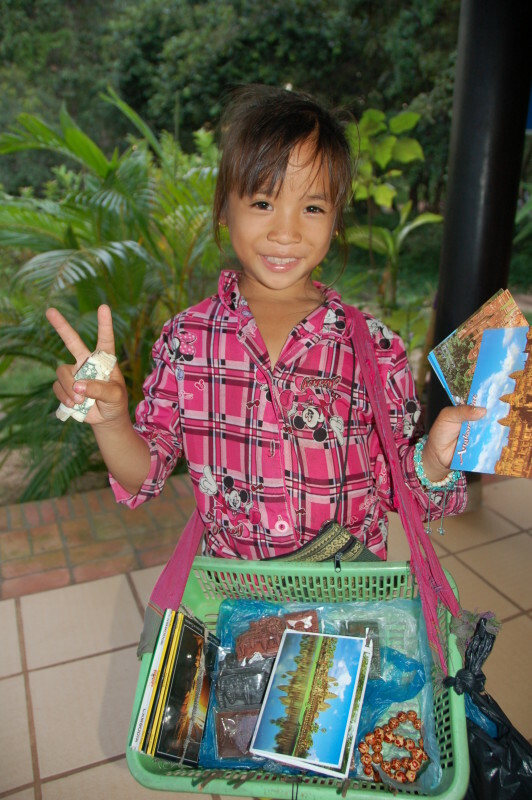 This little girl really wanted her picture taken — so cute! Of course, I ended up buying four bunches of coconut-frond bird-and-butterfly thingies I’ve absolutely no idea what to do with now. And thus ends our first day of touring the Angkor part. 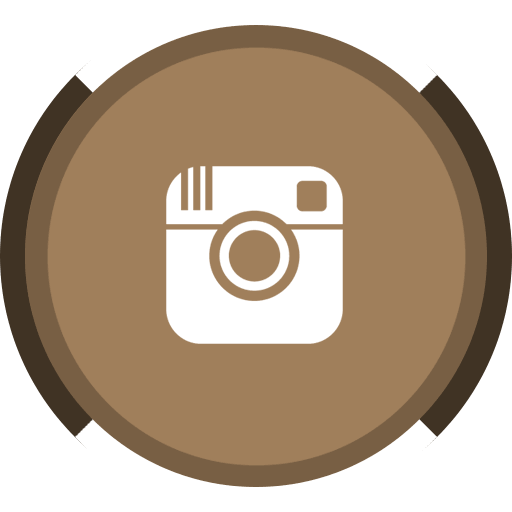 Day two will pick up at Banteay Srey and the Cambodian Land Mine Museum, among other stops.